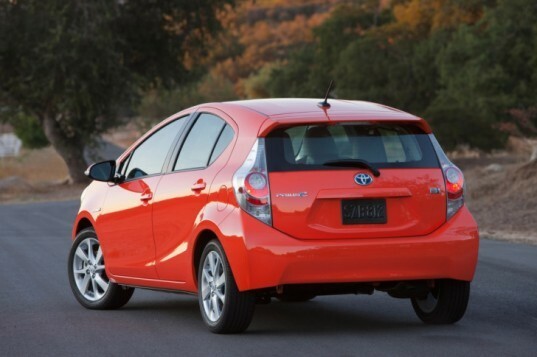 Toyota’s newest Prius model, the 2012 Prius c, is set to hit dealerships next month. The Prius c is now the smallest Prius model available and sits at the opposite end of the lineup from the “versatile” Prius v. The Prius c five-door hatchback is about the same size as the Toyota Yaris and is powered by Toyota’s Hybrid Synergy Drive system, which in this case mates a 1.5L DOHC four-cylinder engine with a 60-hp electric motor and a 144-volt nickel-metal hydride battery. The total hybrid system has an output of 99 horsepower and gets 53 mpg in the city and 46 mpg on the highway meaning its city fuel economy is the highest of any vehicle currently on the market that doesn’t use a plug. Toyota will offer the Prius c in four trim levels: One, Two, Three and Four. Prius c One ($18,950) is the base model that comes standard with automatic climate control, Bluetooth and remote keyless entry. Prius c Two ($19,900) features a 6-speaker audio system, a 60/40 split fold-down rear seat, cruise control, engine immobilizer and a cargo area cover. Prius c Three ($21,635) is chocked full of technology with a display audio system with navigation that adds a 6.1-inch touchscreen. Music fans will also be happy that this trim level comes with Sirius satellite radio, Pandora radio and HD radio with iTunes tagging. It also gets a standard USB port. The Prius c Three model also gets Bluetooth, a Smart Key system with push button start. A moonroof and 15-inch alloy wheels are optional. Finally, Prius c Four ($23,230) is the top Prius c trim and comes standard with 15-inch alloy wheels, Softex-trimmed heated front seats, heated outside mirrors and fog lamps. Buyers can add 16-inch alloy wheels and a moonroof for an extra $1,150. 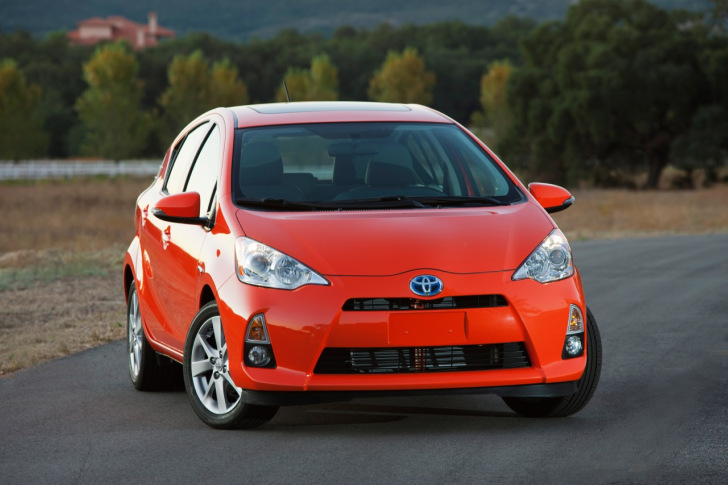 Toyota's newest Prius model, the 2012 Prius c, is set to hit dealerships next month. The Prius c is now the smallest Prius model available and sits at the opposite end of the lineup from the "versatile" Prius v. The Prius c five-door hatchback is about the same size as the Toyota Yaris and is powered by Toyota's Hybrid Synergy Drive system, which in this case mates a 1.5L DOHC four-cylinder engine with a 60-hp electric motor and a 144-volt nickel-metal hydride battery. The total hybrid system has an output of 99 horsepower and gets 53 mpg in the city and 46 mpg on the highway meaning its city fuel economy is the highest of any vehicle currently on the market that doesn't use a plug.